On sale! (normally $89) The Cougar TURRET is an affordable case that combines everything. It sports an attractive and compact design with a computer glass and includes two powerful VORTEX LED fans. 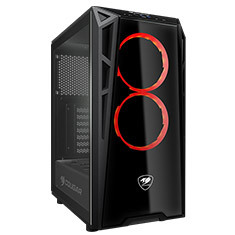 It supports six cooling fans and three radiators, and its Gaming Vent system allows plenty of air to enter the case. It also allows you to install up to three 350mm-long graphics card. What else can you ask for?